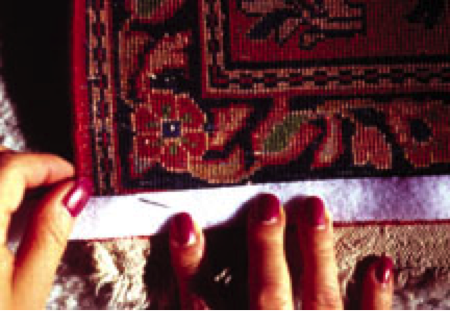 In the last two Rug Specialist articles, we discussed some simple rug repairs. While rug display is not a repair, it will require some needlework and attention to detail that you can provide your customer. Many textiles purchased today are hung rather than placed on the floor. These can include tapestries, silks, Navajo or Oriental rugs. Hanging a rug minimizes the potential for wear and tear, and damage from pets. It also allows the textile to be viewed as a work of art. Never hang or place weavings in direct sunlight or over heating vents. Remind your customer that rugs hung on a wall are subject to moth damage, especially the side against the wall, as they prefer dark out of the way places to lay their eggs. You should offer some type of moth deterrent treatment to your customer. You will need to avoid a pesticide unless you are a licensed pesticide applicator. Remember: Rugs act like filters in a HVAC system and can get quite dusty just hanging on the wall. The displayed item can be vacuumed on the wall using a suction only tool with a household type unit. Rugs can be used in other decorative ways, such as across the back of a sofa, chair or on the top of a table to accent home accessories. If your customer is an avid collector, they may own fragments of very old textiles or items that contain holes. These can be backed with undyed linen and mounted for display purposes. Never use nails or tacks to hang a rug as they offer no support and can damage the rug. Avoid using the method of display that uses metal rings that are sewn on the rug end, even if they are attached to a fabric backing (See Illustration I,). The weight of the hanging rug pulling on the rings can cause stress on the foundation and over time give the rug a scalloped look. An alternative approach is to sew a cotton sleeve to the back of the rug. 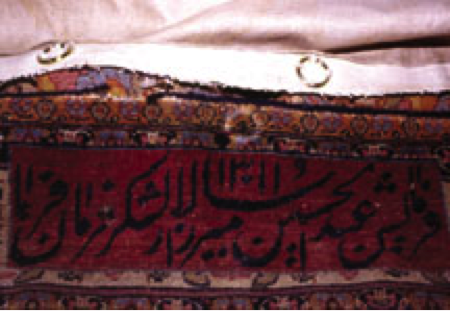 The rug is hung by a metal rod, which is passed through the sleeve. This method also is not recommended, because the sleeve will shrink when the rug is washed. It also is somewhat inconvenient to bring down the rug for a close up view by guests. The recommended procedure is to use Velcro, which is available in one- and two-inch widths; selection depends on the weight of the rug. Velcro offers more support than the above methods as it can hold five pounds per square inch and does not need to be removed when the rug is washed. Remember: Velcro has an adhesive backing. If the adhesive backing is stuck directly onto a painted wall, the paint will peel off when the Velcro is removed. First, determine where your customer wants to display their rug. Then mount a thin board to the wall using screws. To the board attach the hooked, or male, part of the Velcro using the adhesive backing to hold it in place. It can be further secured to the board with staples. Do not use the back of the textile as the female component in this system. The hooking action of Velcro is very strong and the removal of the textile will result in fiber damage. Use a waxed linen thread and sew the female half of the Velcro to the top of the rug. Be certain to attach the Velcro in a straight line just below the rug end. Do not use adhesives or a glue gun. The rug can easily be removed for cleaning or viewing. If the customer desires to rotate the textile then a second Velcro strip should be applied at the other end of the rug. However, a rug will show best if it is hung with the pile toward the ground as this reflects the light better. As the Velcro is sewn in place it can easily be removed later if the owner wants the rug to go on to the floor. This is a simple service to offer your customers and one that does not require a high level of training.